President Moon Jae-in on Friday replaced the commander of the scandal-ridden defense intelligence unit and ordered the creation of a new command "in a break with its past" marred by a slew of political allegations. 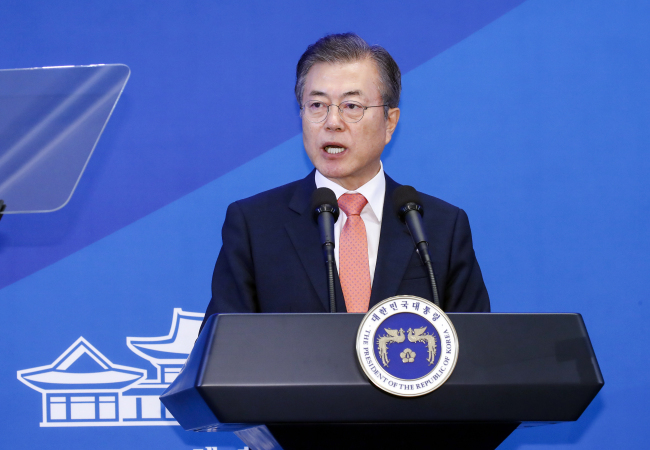 Moon's chief press secretary Yoon Young-chan made the announcement as part of efforts to reform the Defense Security Command following revelations that the unit reviewed the possibility of imposing martial law last year to quell anti-government protests. The president appointed Lt. Gen. Nam Young-sin, the current commander of the Army's Special Warfare Command, to replace Lt. Gen. Lee Suk-koo, who had led the command since September last year. "For the across-the-board and expeditious reform, (the president) ordered the creation of a new command by disbanding and reorganizing the current DSC to historically break with its past," Yoon said at a press conference. To this end, the president called for promptly forming a body to prepare for the establishment of the new command and presidential decrees necessary for the new command, the press secretary added. The commander-in-chief, moreover, ordered that all DSC officers accused of political activities and other irregularities be returned to their original units. The DSC consists of members from the Army, Air Force, Navy and Marine Corps in addition to public officials. "(Moon) also ordered the appointment of a non-military inspector to thoroughly investigate any legal offenses within the organization and take appropriate steps in response," Yoon said. The order came a day after the defense ministry's reform committee proposed a series of sweeping changes, including slashing the unit's 42,000 personnel by 30 percent and abolishing "all of its institutional underpinnings" to enable a wholesale overhaul. The DSC has been the focus of public criticism due to allegations of political interference. Most recently, it has been upbraided for its alleged production of a document over the potential imposition of martial law to quash protests calling for then impeached President Park Geun-hye's ouster.